Home / How to print multiple Australia Post labels on a Sticker Sheet using ELEX WooCommerce Australia Post Shipping Plugin? 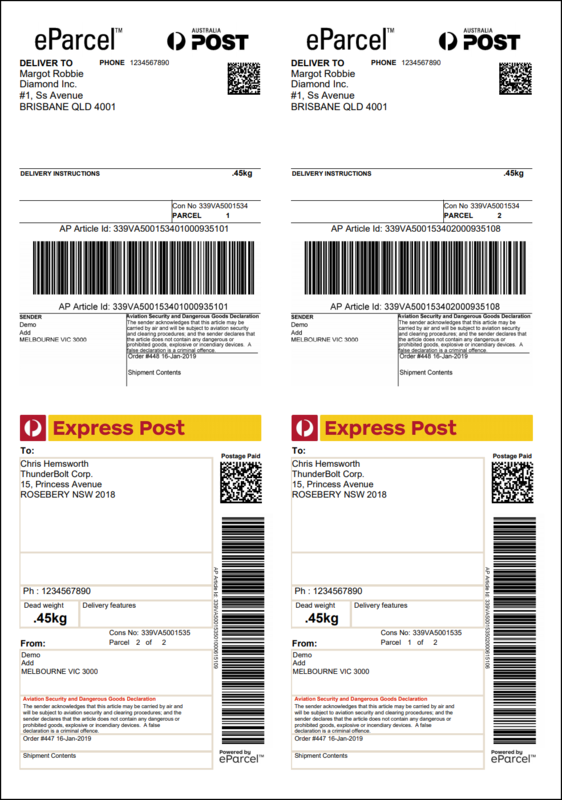 This article intends to provide step-by-step instructions to print multiple Australia Post labels on a Sticker Sheet using ELEX WooCommerce Australia Post Shipping Plugin with Print Label & Tracking. Refer the product page to know more about other various features of the plugin. Although you can print multiple labels for a single order (having multiple packages) in a single sheet, you cannot create multiple shipments and add those labels in the same sheet. For this, only the plugin is not enough, you need to power up with our ELEX WooCommerce Australia Post Bulk Label Printing Add-On to create multiple shipments and print all the labels in a single sheet. 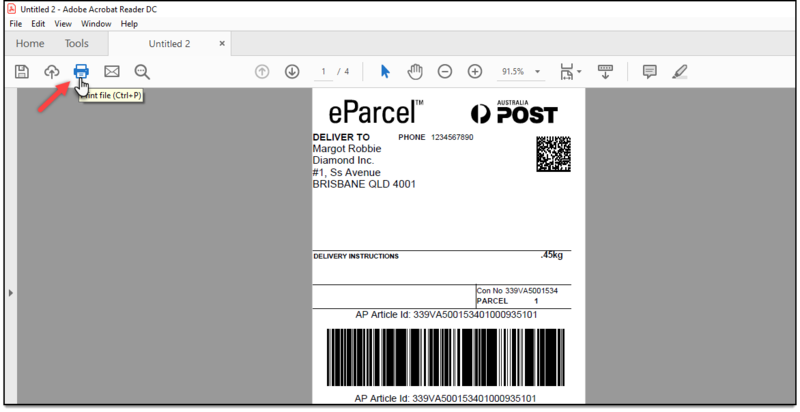 With this method, you can print both Australia Post eParcel as well as Australia Post StarTrack shipping labels. Let me break down the process into three simple steps. 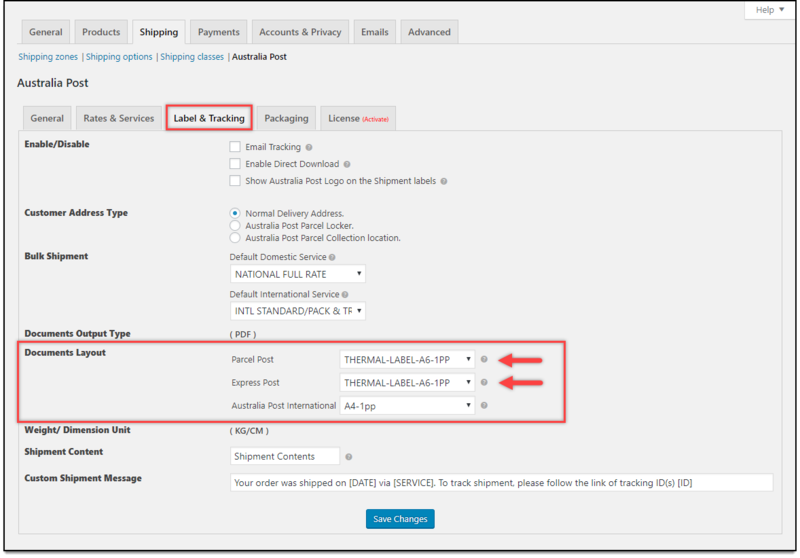 The core label settings should be configured in the ELEX WooCommerce Australia Post Shipping Plugin with Print Label & Tracking. Go to WooCommerce > Settings > Shipping > Australia Post > Label & Tracking section. In the Documents Layout setting, select THERMAL-LABEL-A6-1PP for Parcel Post and Express Post service. This means that the labels will be printed in a single page of A6 size, as shown in the screenshot below. This layout is not available for international shipping labels. The labels will be printed only in A4 size for international shipping labels. Read the Label & Tracking section in the product documentation for more details. You can generate and print Australia Post eParcel shipping labels in bulk using ELEX WooCommerce Australia Post Bulk Label Printing Add-On. Go to WooCommerce > Australia Post Bulk Print Labels. 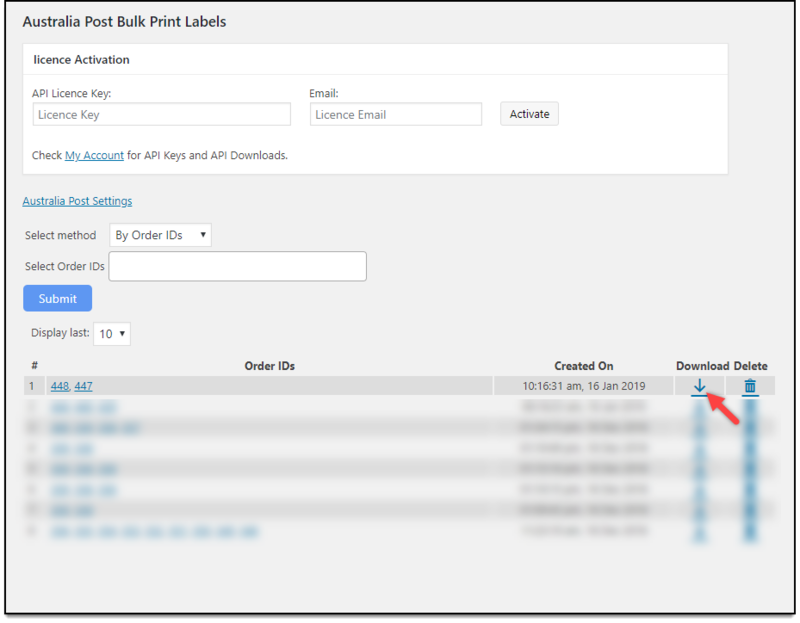 To bulk print labels, you can either choose to enter desired Order IDs or select the Order date range. For demonstration, let us select two orders IDs consisting of orders with Australia Post eParcel and Express services. Each order has two packages resulting in four shipping labels to be generated. Once the labels are generated, download the PDF file to your computer. Read the add-on documentation to know how to configure the add-on settings. Open the downloaded PDF from the previous step using Adobe PDF Reader. You can scroll to find all the labels generated with the add-on. Based on our demonstration, the add-on has generated four labels and merged them into a single PDF. To print the PDF file, type Ctrl+P on your keyboard or simply click on the print icon on the top left corner menu bar to open the print interface, as shown in the screenshot below. 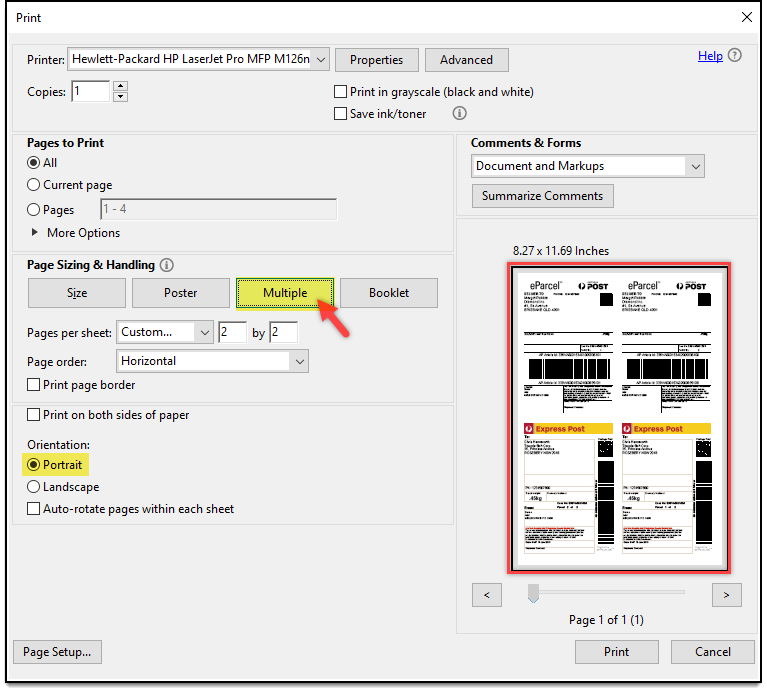 Next, under the Print Sizing & Handling section, click on the “Multiple” button to print multiple sheets per page. The preview on the bottom right will show you how the labels will be printed. Make sure the orientation is set to Portrait for a better content alignment. A sample screenshot of the settings is shown below. Finally, click on the Print button to proceed with the printing. Below is a screenshot of the four labels in a single sheet. Remember, the label content and the alignment will spread across according to the paper size in your printer. If you have set the paper size like A4, the four labels will be uniformly divided and printed in the A4 sheet. Similarly, according to your sticker sheet, the labels will be spread out.